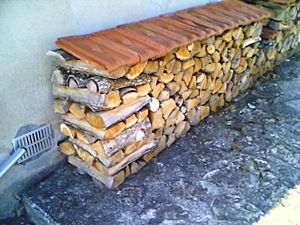 Firewood is any wooden material that is gathered and used for fuel. 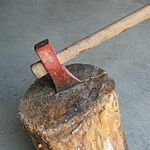 Generally, firewood is not highly processed and is in some sort of log or branch form. There is debate about whether wood will dry more quickly when covered. 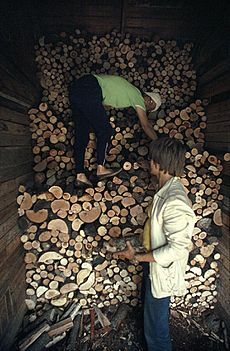 There is a trade-off between the surface of the wood getting wet vs. allowing as much wind and sun as possible to access the stack. A cover can be almost any material that sheds water – a large piece of plywood, sheet metal, terracotta tiles, or an oiled canvas cloth, even cheap plastic sheeting may also be used. Wood will not dry when completely covered. 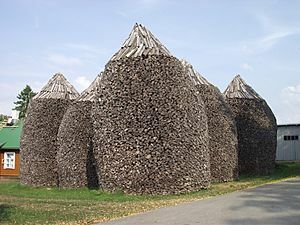 Ideally pallets or scrap wood should be used to raise the wood from the ground, reducing rot and increasing air flow. Firewood Facts for Kids. Kiddle Encyclopedia.